Dylan loves his family's yearly vacation to Holiday and wishes it could last all year. When he finds a flyer asking if he'd like to keep Holiday, he encounters a bigger and better Holiday than the one his family has always visited; he also learns that entering it requires the Founder's authorization. Thus begins Dylan's quest to meet the one of whom people keep saying: "You can't find the Founder; he finds you./He's not just the Founder, he's the Finder too." As Dylan reads of Holiday's origins, he experiences a number of adventures and meets characters who represent the sights and sounds he always finds in Holiday-characters who explain how each of these familiarities points to the Founder's previous rescue of the city's inhabitants. And the more Dylan learns, the more he longs to personally know the one who holds the key to entering the "real Holiday." Writing for elementary-age children and older, author, teacher, and grandmother Starr Meade offers a book that families can read together, discovering along with Dylan how God brings a person to faith. 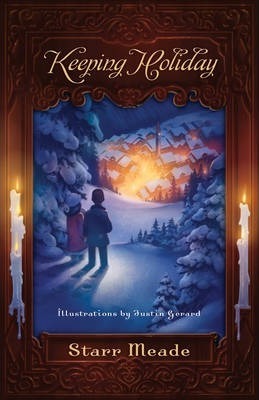 Keeping Holiday is also a charming, insightful way to help children grasp the meaning of the Incarnation. Starr Meade served as the director of children's ministries for ten years at her local church and taught Latin and Bible for eight years at a Christian school. She is a graduate of Arizona College of the Bible and has authored a number of books. Starr lives in Arizona with her husband, where she currently teaches homeschool students and is mother to three grown children and six grandchildren. JUSTIN GERARD is an illustrator with Portland Studios. His work has been featured in Spectrum and Society of Illustrators. He is also a recipient of the IPPY Award for his illustrations in Beowulf Book One: Grendel the Ghastly. He lives in South Carolina.